Looks like a gift from a Mark Mothersbaugh in an alternate reality. De-evoloution is real and alive in the multiverse. Here is a tool to pull the wool over your own eyes while counting the proverbial sheep. As an added bonus, while wearing this device, you are guaranteed to be free of all government mind-reading. 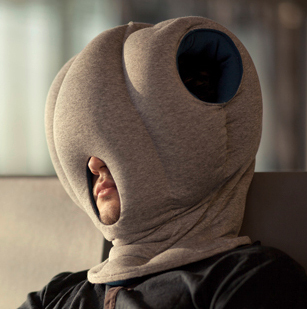 OSTRICHPILLOW® offers a micro environment in which to take a warm and comfortable power nap at ease. It is neither a pillow, nor cushion, bed or garment, but a bit of each all at the same time. It’s soothing cave-like interior shelters and isolates both your head and hands, perfect for a power nap.